Now don't get me wrong I usually LOVE Eve Langlais' books, but NOT this one! I tried- REALLY tried to like it. Read first six chapters... whiny heroine with issues- turned me off. Tried the middle of book... whiny heroine with issues and two great guys- turned me off. Tried the last chapter and epilogue... whiny heroine with two great guys who love and lavish attention on her, but she doesn't trust them AND sounds proud that she hasn't told them she loves them back- REALLY turned me off. If this is your first book by Eve Langlais, PLEASE give her another chance! This book is not a good representation of her writing! I have to be honest and say that I was not expecting to enjoy this book, only because it is so different from what I usually read by Eve. I loved the storyline and the main characters and I can't wait to read the next book Mr. Peabody's House. I like the fact that the characters have their own personalities and try to work together. I had a hard time putting this book down. 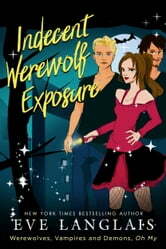 "A Vampire, a Werewolf, a demon and Delusional Prude:What Could Go Wrong??" Welcome to my New Year's Resolution! I hope it adds a few titles to your "To Be Read" list. Like this one! As this-and future- reviews will make it clear I really enjoy Eve Langlais' books I should probably state right off the bat that I am in no way personally or professionally associated with Ms Langlais or her affiliates. These reviews are just my opinion and a fun way for me to nerd out...I always liked writing book reports in school. So when I recommend you buy this book I'm just peer pressuring you. I'm not getting paid or anything.. I've never met a dessert I didn't like, & Eve Langlais is one of those authors whose books, like dessert, I will never pass up. Each is a true delight. Ms Langlais seems to have come up with the Paranormal Romantic version of the perfect cupcake recipe. It's tried, true, satisfying, yet leaves you dying for another taste... "Werewolf Indecent Exposure," like the perfect chocolate cake, is an ideal first novel in what I'm certain will be another great series. This book introduces us to the world our characters inhabit-similar enough to our own to make the transition easy. We meet our repressed heroine, Chloe, and the werewolf and vampire suitors determined to destroy her walls, rules, and, oh yeah, the demon chasing her. Because while screaming orgasms are great, "Happy Endings" are worth a Werewolf's substantial weight in gold. Assuming everyone lives long enough to enjoy it.